Microwaves are one of the most frequently used home electrical appliances. These marvelous kitchen devices are very popular because they can help you to rustle up your meals within minutes. It would be hard to find a kitchen without a microwave. Whether you would want to heat up your leftovers or prepare fantastic food for your family, having a countertop microwave will save you a lot of time and space. 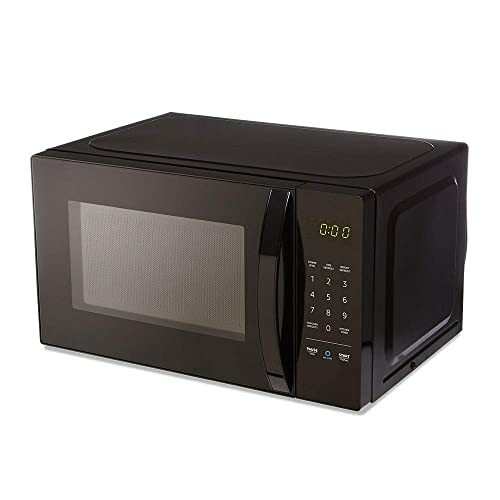 To help you get the best deal when shopping for a countertop microwave, we have reviewed the best countertop microwave models for you. Do you need a microwave whose functionality is streamlined and easy to use? Then you need to check out Alexa AmazonBasics Microwave. This microwave manufactured by Amazon has lots of features that set it apart from most microwaves. It is a smart microwave. With this microwave, you will be saved from having to press multiple buttons to get things done. Since it is fitted with voice control features, you can just ask your microwave to heat your food for you. That’s not all, the Alexa AmazonBasics microwave automatically determines how much heating time different food types require. You can also make popcorn with your microwave. Besides that, the AmazonBasics microwave also comes with an auto defrost feature that you can use to heat frozen food. Setting up this microwave is easy since it doesn’t require any manual set up at all. All you need is an echo device, an Alexa app, and a Wi-Fi connection. Another feature that we loved about it is its compact size. This makes it suitable for use on your countertop without worrying that it might fall off and get damaged. You might worry that since it is operated through voice command, it might slip up in following your commands. All you have to do is follow your preset commands word for word. 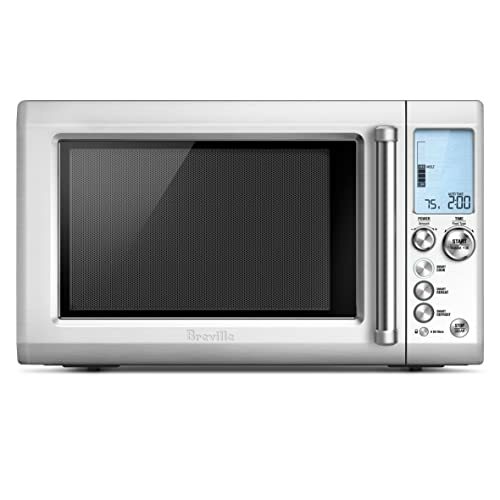 Recommended for: Those who are looking for a microwave whose functionality is streamlined and easy to use. It is inexpensive as compared to other microwaves. Its compact size enables it to be suitable for use on countertops. Saves you from guesswork when cooking certain items. Can also be operated manually like a regular microwave. Even heat distribution to perfectly heat your food. You still need to buy an Amazon Echo speaker to use the voice command. Its size may be too small for some families. Made in a size that is compact, the Sharp Microwaves Countertop is convenient to have in your kitchen. It is perfect for snacks, beverages, frozen food and even heating different types of meals at home. It can fit anywhere you want it to due to its small size. It has an interior capacity of 0.9 cubic feet. It features a 13.5-inch wide turntable that is capable of holding even large dinner plate and casseroles. It has a cooking power of 900 watts to ensure that your food is well cooked. In some microwaves, when cooking at low power, they usually switch themselves on and off to achieve that low power. However, the Sharp Microwaves Countertop is different. It is capable of operating continuously at low power throughout the entire cooking period. As a result, it cooks food evenly without the food having cold and hot spots. It also features a turbo defrost that quickly and efficiently heats frozen food. Its unique cooking sensor enables it to adjust the cooking power and time automatically. What’s more, its keep warm feature enables you to keep your food warm for longer periods so that when dinner is finally served, it is hot and fresh. Recommended for: Those who are looking for microwaves perfect for snacks, beverages, frozen food and even heating different types of meals at home..
Its turbo defrost facilitates fast and accurate thawing of frozen food. 5 inch carousel turntable enables it to cook food evenly. Can be used to make popcorns and even beverages. Features a glass door that is scratch-resistant. Has 11 different cooking levels. Its stainless steel finish makes it easier to clean. Comes with a useful kitchen timer so you can set how long you want your food to cook. The plastic over its control buttons may begin to deteriorate after some time. It slides around the countertop every time you try to open its door. The Danby Designer Countertop Microwave features a sleek design that enables it to blend with any of your kitchen décors. What we love about it is its superior cooking capabilities. Its interior has a capacity of 0.7 cubic feet. It is, therefore, suitable for lunchrooms, kitchens, and even offices. It has a cooking power capacity of 700 watts to enable it to cook any type of food easily. That’s not all; the Danby countertop microwave operates in 10 different power levels. You are, therefore, assured that it will perfectly cook your favorite food. Moreover, Danby microwave is also fitted with a one-touch cooking function for cooking six types of foods that are popular. You can easily read, program and monitor your microwave through the clock device and LED timer on it. It is perfect for use on kitchen countertops due to its compact design and lightweight nature. It only weighs 26.46 pounds. Recommended for: Those who are looking for microwaves features a sleek design that enables it to blend with any of your kitchen décors. Easy to use due to its one-touch cooking function. Suitable for any kitchen décor due to its stainless-steel finish. You get 18-months warranty from the manufacturer when you buy it. The black dotted window makes it difficult to see inside the microwave. The glass on its door may crack due to heat after some time. It retains smells from food which may lead to odor if not properly cleaned. 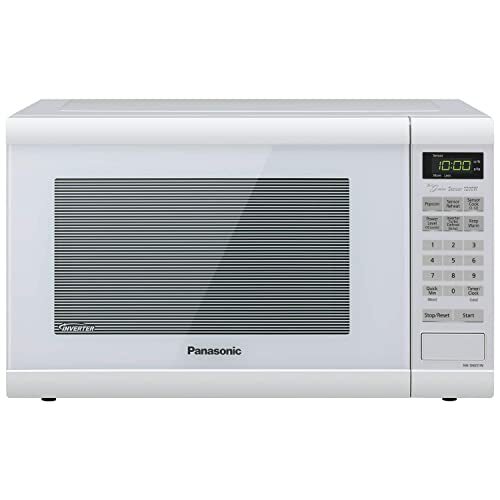 If you are looking for a microwave with excellent cooking capabilities and efficient energy usage, then this Panasonic 1.6 Cu Countertop Microwave is worth checking out. It is made with the Inverter Technology that delivers a cooking power of 1250 watts to properly cook your food. What we love about this countertop microwave is that it is capable of delivering power steadily throughout all temperature settings. Due to its perfect cooking capabilities, it is capable of delicately simmering your food so that it doesn’t overcook. Your food will also retain its color, nutrients, and texture after cooking. The Panasonic 1.6 Cu microwave has a maximum interior capacity of 1.2 cubic foot together with a turntable with a 13.4-inch diameter. This microwave can, therefore, accommodate after-school snacks, breakfast foods, dinnertime meals, and even appetizers. Its turbo defrost feature uses microwave sequencing to quickly and evenly thaw frozen food. Its sleek controls feature a four-digit display to enable you to control how you want your food cooked to achieve the results that you desire. This microwave also has a keep warm feature that lets you keep all your delicacies warm in it until the time that you will be ready to serve them. Recommended for: Those who are looking for microwaves with excellent cooking capabilities and efficient energy usage. Has a high-end look that makes it add to your kitchen décor. You can set how long you want your food to be cooked or reheated. Delay start feature lets you determine when you want it to start cooking your food. Its large interior capacity makes it great for cooking meals for the whole family. The door closes and opens easily. Designed with a 6-one-touch function that perfectly cooks and defrost by weight. The door latch inside it may break after longer use. Its beeper is not loud enough. This stylish piece from Toshiba features an exterior casing that is made of premium stainless steel. Even better, it has excellent features that will give you a convenient kitchen experience. Its compact size, roomy interior, multi-programmable functions, and digital control panel makes it a good addition to your kitchen appliances. The first feature that drew our attention was its design. Its elegant exterior design will perfectly match your kitchen’s countertop. In terms of size, it is suitable for small kitchens due to its compact size. It has a power capacity of 900 watts to enable you to cook food within the shortest time possible. Operating this microwave is easy since it has a digital display and a one-touch button. It also has an LED lighting system inside it so that you can easily prepare your favorite meals. You can easily prepare many different types of meals since it comes with six preprogrammed settings. Its 0.9 cubic feet of space makes it capable of cooking meals for your family. Recommended for: Those who are looking for microwaves with excellent features that will give you a convenient kitchen experience. Given its features, it is reasonably priced. Has a tone that beeps to let you know when it is done cooking your food. Its 12-inch turntable is large enough to allow you to prepare a variety of foods. Has a sleek appearance due to its stainless steel exterior. Does not take too much countertop space. You can prepare a variety of meals with ease six pre-programmed settings. Has a child safety lock feature. Its power saving mode lowers energy consumption. Its base slides on the countertop whenever you try to open its door. Its defrost feature starts lagging after using the microwave for a while. This is the best microwave option for you if you are looking to buy a high-tech countertop microwave. However, you have to be ready to pay a little extra to bring it to your kitchen. It is equipped with several sensors that automatically adjust the time required for cooking your food based on what type of food you want to cook. The sensors calculate cooking time by automatically measuring the humidity that is released from the food. This microwave is easy to use and allows you to adjust power within a short time. Breville microwave is designed with stainless steel in its interior that makes cleaning it to be easy. Its construction is a step above most microwave brands. What’s more, its controls are knob-based to allow you to fine-tune your cooking. Its controls are highly intuitive and easy to use. This microwave is capable of handling many types of cooking like baking potatoes, popping popcorns and cooking broccoli. Since it has 10 different power levels, you can regulate its power using a dial twist from 10% to 90%. Its smart defrost feature works excellently so that food is not overheated or overcooked. Its one-touch auto buttons enable gives you shortcuts to functions that are frequently used. 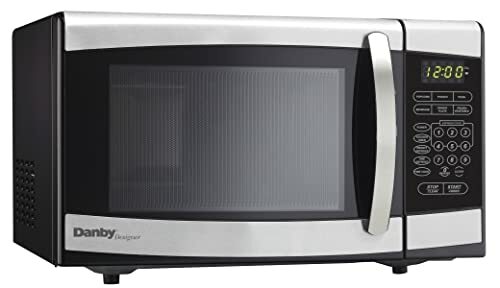 Recommended for: Those who are looking for a high-tech countertop microwave. Its reheating properties are excellent. Made of stainless steel that gives it a stylish look. Has a power capacity of 1100W to enable you to cook all types of food. Comes with a one year warranty from the manufacturer. Quick start function makes it convenient and user-friendly. The door opens and closes easily. Interior is large enough to handle larger plates. Its surface always stays cool even after long periods of cooking. May overcook your food if you use its smart sensor in reheating your food. Its dial is quite finicky. The hOmeLabs Countertop Microwave is good for cooking meals when you are in a hurry. This is because it heats faster since it has a power capacity of 1050W. Whether you have a big kitchen or you live in a small apartment, this microwave can be suitable for you. It has a black finishing that is made of stainless steel to give it a stylish look that will add to the décor in your kitchen. With an interior capacity of 1.3 cubic feet, this microwave can handle large plates to allow you to cook food for your small family. It comes with 11 cooking functions, 10 different power levels, and seven pre-programmed settings to allow you to cook all kinds of food from making popcorns to pizzas to steaming vegetables. You also have the option of defrosting your frozen food by weight or by time. You can also reheat your food quickly by pressing the speedy cook button. The hOmeLabs microwave also has a revolving glass turntable plate that enables food to cook evenly. The turntable is BPA free, removable and dishwasher safe. Recommended for: Those who are looking for microwaves that is good for cooking meals when you are in a hurry. Child-lock safety feature keeps your child safe at home. Has a stylish and modern look. Its interior light enables you to monitor your cooking progress. Its 10 various power levels facilitate even cooking. It beeps at the end of the cook cycle. Awesome microwave for the price. The buttons are a bit stiff to push. Quite heavy since it weighs 40 lb. After a while, the turntable may start to produce some screeching sounds. A convection microwave combines both microwave cooking and convection for a faster and more even cooking. This is because the food is not only coked as a result of the interior heating of the microwave but also as a result of convection heating from the hot air. Due to its automatic roast and bake functions, you can roast chicken in your microwave, thaw your frozen pizza and heat it up until it’s cooked and even bake your crispy fries. With just the touch of a button, you can prepare your favorite meals. Reheating and cooking your foods is easy and quick since there are ten power levels you can choose from to give you the results that you desire. When thawing your food, you can also select the time defrost option or the auto defrost option. Since its interior is made of stainless steel, you will have an easy time cleaning it. Its 13.6-inch turntable is made of glass and is also easy to clean. You can also detach it from the microwave so that you can clean it in a dishwasher or using hot water. Recommended for: Those who are looking for microwaves combines both microwave cooking and convection for a faster and more even cooking. Versatile since it combines microwave heating with convection cooking. It’s convenient since it uses sensors to ensure that food is not overcooked. There is an LED light in its interior for better visibility. It’s easy to operate due to its digital control panel. Interior made of stainless steel to make cleaning easy. Can cook nearly all types of meals. This compact countertop microwave will give your kitchen a touch of style and fun due to its stylish look. 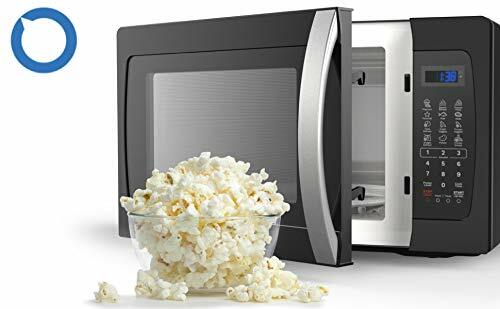 It is another good countertop microwave option if you are looking for a small yet mighty microwave. With a capacity of 0.7 cubic foot, the Bella 700W Compact Microwave is suitable for cooking meals for a midsized family. It will offer you with 700 watts of cooking power to perfectly cook your food. Its 10 power levels give it versatility since in food preparation. It has a 10-inch turntable that makes it capable of handling standard-sized plates. Its attractive finishing is as a result of the high-quality plastic that is used to construct it. In terms of weight, it is super light because it only weighs 22.5 pounds. Its 1 to 6-minute quick start feature enables you to effortlessly reheat your food. It also comes with six preset menus so that you can cook various meals without having to guess how to cook. 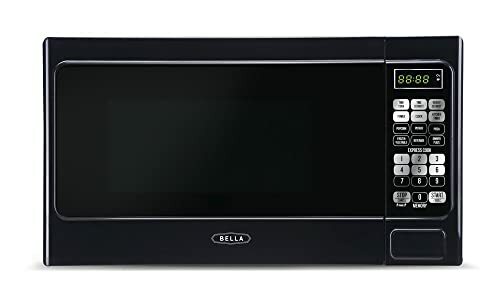 The BELLA microwave also has a defrost feature that lets you cook your frozen food. You can either choose to defrost by weight or by time. What we loved about this microwave is its memory function that lets you save and recall all your custom controls. 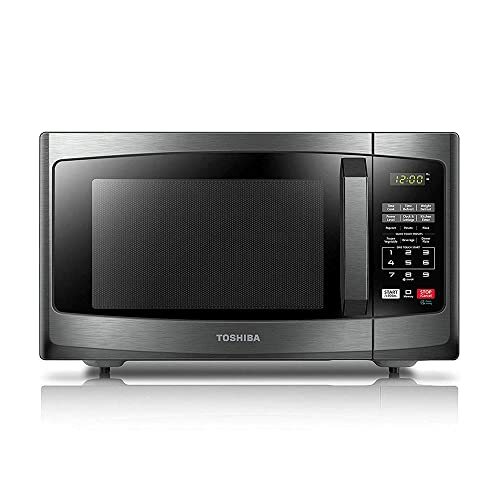 Recommended for: Those who are looking for a small yet mighty microwave. Comes with a kitchen timer and clock display to let you keep track of your cook times. The turntable is made of glass, removable and dishwasher safe. Features a keypad lock to prevent unsupervised use. You can save your custom presets with its memory function. Its heating is a bit slower. Not suitable for a large family. Condensation and steam build up as the food cooks. Contemporary microwave brands use the pulse on and off cooking technology by simultaneously lowering and raising the temperature. However, this Panasonic microwave uses inverter technology that enables it to generate a steady power stream to achieve consistently and even cooking. As a result, you are assured of an excellent cook since your food will be delicately simmered to avoid overcooking. Most importantly, you will enjoy cooking delicious food that retains their color and taste in this microwave. With a wattage rating of 1200, you are assured of preparing your food faster and easier. It has an interior capacity of 1.2 cubic feet which means that you can prepare food for your small family in this microwave. Thanks to its four-digit sleek display and touch-button control, your cooking experience will be practically effortless. That’s not all; this Panasonic microwave comes with 12 preset menu selections to maximize your cooking convenience. Its turbo defrost feature will help you to prepare your frozen food more efficiently. This feature uses a sequencing system that is based on its continuous-power delivery system to evenly thaw frozen foods quickly. Its keep warm feature enables you to keep your soups, vegetables, sauces, and gravies warm and delicious for longer. Recommended for: Those who are looking for microwaves enables it to generate a steady power stream to achieve consistently and even cooking. Its one-touch sensor takes away guesswork from your cooking by adjusting power levels automatically. Has a timer that lets you set the reheating and cooking time. Includes a child safety lock to prevent accidental operation of the microwave. The menu screen is interactive. The light does not turn on when you open the door. End alarm can be easily missed since it’s in a series of short beeps. The size of microwaves is measured in cubic feet. This lets you determine the size of dishes that can fit in your microwave. If you want a microwave that can serve you and your family, then you should go for one with a larger cubic feet capacity. A 1.5 cubic feet or more would be suitable for you. On the other hand, if you are living alone or with just your partner, then a microwave of 0.8 to 1 cubic feet would do. Countertop microwaves have different power levels. Their power capacity usually ranges from 700 watts to about 1250 watts. There are microwaves with a higher wattage than that. If you want a microwave that can prepare your food at a faster speed, then you need to buy one that has a higher wattage rating. 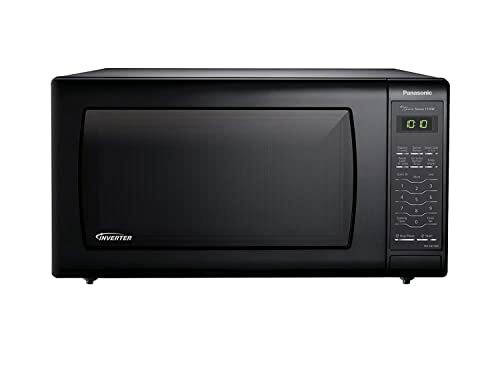 If you also want a microwave that you can use several times a day as an office microwave, then going for one with a higher wattage rating would be ideal. Microwaves with lower power capacity cannot handle being used frequently and may get ruined easily. This is a very useful feature that every microwave should have. The digital display should have LED lights and be labeled clearly so that you can easily see your selections even if you are cooking in a dark room. Most microwaves have features like “add time’ and “quick cook” as one of the features on their display system. In the past, microwaves came with just two power options; “high power” and “low power”. However, with advanced technology, most microwaves today have multiple power options. Most of them have 10 power levels. By selecting different power levels, you can be precise on how much heat you want your food to be cooked with. No more dealing with dried out foods or waiting for ages for your food to get cooked. Some microwaves even have the “keep warm” feature to keep your desserts, stew and soup warm without using too much microwave power. The size of the turntable determines the size of the plate that your microwave can handle. You should, therefore, go for a microwave that has a wider turntable. The turntable is very important since it rotates to ensure that food gets heated uniformly. A larger turntable can handle larger plates without the edges of the plate preventing it from rotating. Besides that, you should also ensure that the turntable is made of glass. You want to have an easy time cleaning your turntable since you can just detach it and toss it in a dishwasher. A microwave with multiple cooking modes allows you to choose options that are suitable for cooking a particular type of food. These modes include “popcorn”, “beverage”, “frozen dinner” and “pizza”. For example, when thawing frozen food, you don’t have to know how long you should heat your food or what power level you require. All you need to do is select the “frozen dinner” mode and let your microwave do the rest. A countertop microwave should not be too heavy. It should also not take up too much space on your countertop. If you are someone who likes to move a lot, then you should go for a lightweight microwave that weighs about 25 pounds. However, if you stay with your family in your home, then buying a 40-pound microwave would be okay. 1. How Useful Are Countertop Microwaves? You might think that microwaves are only useful in reheating leftovers. Well, there are a lot of things you can do with your countertop microwave. For microwaves with lower wattages, they are only suitable for reheating your dinner leftovers so you can have them for breakfast. However, countertop microwaves with higher wattage can be used to cook desserts, roast fish, chicken and bacon, cook potatoes and many more. Some countertop microwaves are designed with extra features like grill racks so that you can make your food crispier. 2. How Much Power Should They Have? The microwave power that you go for will be determined by your needs. For example, if you intend to use your microwave for just reheating your food and beverages, then going for a lower-wattage microwave would be fine. A 700 watts microwave would be suitable. If you are planning to use your microwave to cook most of your meals, then you will need to go for one with a higher wattage. For example, a 1250-watt microwave is capable of baking a potato in less than two minutes. 3. Are These Microwaves Spacious Enough? The interior space of microwaves is measured in cubic feet. Smaller countertop microwaves have capacities of between 0.8 to 0.9 cubic feet. Microwaves suitable for family use usually have capacities of at least 1.2 cubic feet. To ensure that you buy a microwave that can fit a larger dish size, you should look at the size of its turntable. The turntable is the rotating “plate” inside a microwave that is usually made of glass. 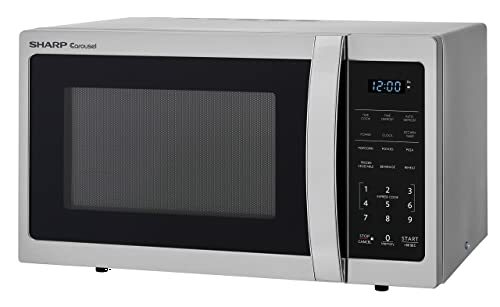 Smaller microwaves usually have turntables that are about 10-inches wide while larger microwaves have turntables that are 14-inches or more in diameter. 4. What Are the Various Cooking Modes in Most Countertop Microwaves? Thanks to cooking modes, you don’t have to guess or experiment while using your microwave to prepare your favorite dish. Most countertop microwaves are designed with various cooking modes that allow you to just push a button to heat or cook your meal and it will do the rest. The various cooking modes include “pizza”, “popcorn”, “beverage” and other dishes. Other useful functions that most countertop microwaves have include “cook by weight”, “soften” and “add time”. A microwave with many cooking modes is very useful since it is versatile. 5. Do Microwave Power Levels Matter? Yes. Power levels are very important. They give you more control over how you want your food to be heated or cooked. A microwave with no power levels will just limit you to “low” or “high” power levels that may not cook your food precisely the way you want it. Modern microwaves have between 6 to 10 power levels to give you better cooking results. 6. How Much Should a Countertop Microwave Weigh? Well, countertop microwaves weights vary depending on the brand. Smaller capacity microwaves usually weigh around 25 pounds. Larger microwaves can weigh up to 40 pounds. 7. Can My Microwave “Sense” How Long It Should Heat Food? Most microwaves are nowadays fitted with smart sensors that enable them to automatically adjust how long it needs to heat something. These microwaves have built-in sensors that measure the humidity from the foods so that it can now determine how much cooking time is required. This smart feature prevents food from overcooking and burning. 8. Are Microwaves Capable of Defrosting Frozen Foods? Today’s microwaves nowadays have technologies that enable them to excellently thaw food using low power energy. With features like “Time Defrost” and “Defrost by Weight”, microwaves gradually prepare frozen food. You will be spoilt for choice when shopping for a countertop microwave. There are several microwave brands you will choose from, depending on the features that you are looking for and how much you can afford to pay. We have reviewed for you 10 best countertop microwave models. You can choose one that can cook enough food quantity depending on whether you live alone or have a family. When it comes to our pick of the best countertop microwave, we would recommend the Panasonic Microwave with Inverter Technology. What makes it our best pick is the inverter technology that enables it to cook food with a steady power stream so that food is consistently and evenly cooked. Its high-end look will also improve your kitchen décor. Besides that, its 1.2 cubic feet interior capacity means that you can cook meals for the whole family.